Bodiam Castle is located near the village of Robertsbridge in East Sussex. It was constructed in the 14th century to defend the area against a possible invasion by France during the Hundred Years’ War. Here are some other facts about Bodiam Castle. Bodiam Castle was built by Edward Dalyngrigge, one of Henry III’s knights, in 1385. It is made from sandstone and doesn’t have a keep. Instead, the rooms and chambers are built against the curtain walls. Bodiam Castle has towers at its corners and entrances and a large moat. As well as providing an additional layer of defence, Bodiam’s moat also made the castle look larger and more formidable than it actually was. It is a quadrangular (square shaped) castle. During the reign of Richard III, a siege against Bodiam was planned. Records do not show whether or not the attack went ahead. Much of Bodiam’s interior was destroyed by parliamentarians during the English Civil War. They were attempting to reduce the risk of fortified buildings being used against them. Thankfully, the castles exterior was left alone. 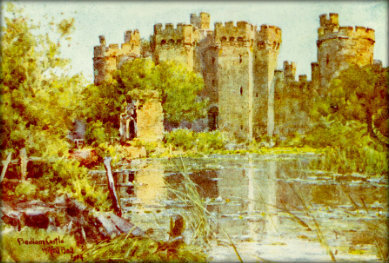 During the 17th and 18th centuries, Bodiam Castle became a ruin. Drawings from this era show the castle in a state of disrepair and covered in ivy. Bodiam Castle is now a tourist attraction run by the National Trust and it is visited by more than 150,000 people every year. The castle has appeared in the movie Monty Python and the Holy Grail, an episode of the TV show Doctor Who, and a music video by Enya. Click the link to find out more about castles. This is good information of the castle. Our teacher gave an assignment of making a castle and I choose this castle because its awesome and kind of the castle I wanted. I also have to make a castle and me and my group chose this one. cool. thanks for the advice it helped me loads in my castle project. Thanks for using Primary Facts, Sofia. This Bodiam castle is so fascinating and interesting to learn about! yeah me too I have to make a project on a castle and I choose this one as I have been there before and it is so awesome. i have to make a medieval castle for school and this is very good facts and information about the bodiam castle. I had to do a model of this castle and I got an A+ on it because of this information. Thanks! this helps a lot. I had to make a castle for school and this was the exact information i needed!! This gave me lots of great facts for a homework assignment in history.